Correspondence between Cardinal Dougherty and Zita, Empress of Austria. Discusses Dougherty paying for the education of an Austrian seminarian. Zita of Bourbon-Parma, 1892-1989., Kerssenbrokh, Theresa S. , and Dougherty, Dennis J. 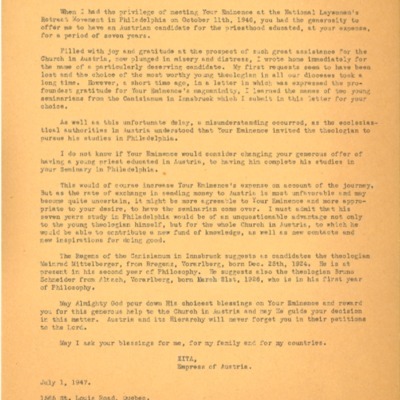 (Dennis Joseph), 1865-1951., “Correspondence between Cardinal Dougherty and Zita, Empress of Austria, 07/1947-09/1947,” Catholic Historical Research Center Digital Collections, accessed April 21, 2019, https://omeka.chrc-phila.org/items/show/7862.